One of the best ways to ensure a successful summer party is to organize your space. This regulate the flow of traffic throughout the party and keeps people from standing in position which can make the space feel cramped. Strategic placement of food and furniture can help your space feel more open and the guests more comfortable. You can also organize your furniture my function. All dining furniture should be kept together while all casual lounge seating is in another section. This keeps things uncluttered and has an efficient flow of traffic. 2.Provide shade for your guests. This summer party tip is particularly important when it comes to guests’ comfort. With summer parties comes lots of sun. Not only can an awning of some kind give you and your guests’ eyes some relief, but it can also help to cut down on the heat that comes with sitting in direct sunlight. There are several different designs that can provide shade on your deck or in your backyard. The easiest is going to be your standard umbrella that attaches to your table. Pergolas are a basic frame that you can attach curtains or the right climbing plants to create a shady spot. 3. Lighting will define your space. Lighting is one of the most important aspects of any space’s design. It can put the finishing touches on any space and create an ambiance. Outdoor lights come in a wide variety of styles and designs. The most versatile are rope lights. Rope lights are string lights that are in a flexible plastic casing. This shell is a weather proof barrier between the lights and the elements. They can be installed just about anywhere in your space. If you have an outdoor dining area, café lights are a popular design option. These bulbs are clear Edison style bulb mixed with the string light design. They can be strung across open areas to create a false ceiling feeling. It encloses your space makes more a room like space outside. 4. Use outdoor friendly materials. One of the easiest ways to make sure your outdoor summer party runs smoothly is to use outdoor friendly materials. From your table settings to your cushions, the right materials make outdoor entertaining easy. Starting with the table settings, durable plastic tableware comes in a wide range of colors and designs. You can create a formal dining room setting outdoors with chic white plates and gold accents. If you want to add a pop of color to your outdoor party, these unbreakable items come in a large variety of bright colors and fun designs. Apply these same design principles to your serving dishes. They make for easy clean up and stress free dinner parties. This durability should also be applied to your outdoor textiles. Between the elements and the more casual nature of outdoor summer parties, your outdoor fabrics are subject to a lot more wear and tear. Thicker fabrics, like canvas and vinyl, are perfect for standing up to the elements. A cotton canvas will be more comfortable when it comes to seating, while vinyl is good for furniture covers while the pieces are not in use. If you can’t find the perfect color or fabric for your outdoor space, you can easily paint your own pieces and create unique designs. 5. Maximize the space you have. Don’t feel like your space limits your outdoor entertaining possibilities. Take inventory of your available space and maximize it! Whether you have a ground level patio or a multi level deck, you can create a dynamic space that is perfect for your summer parties. Going back to the first summer party tip of organization, have defined areas in your outdoor entertaining space. While it may be easier to define and separate areas with different levels or under deck patios, you can still achieve this layout with a single level deck or patio. Another way to maximize your space is to have proportionate furniture. While it may be tempting to fit as many pieces as you can into your space, use larger but fewer pieces. This fills your space without overcrowding it, which can actually make it feel bigger! 6. Landscaping is like tidying your backyard. If you were having entertaining in your home, you wouldn’t want visible stains on your carpet or unfinished paint jobs on the walls. This same principle should be applied to your outdoor space. Finishing a walkway in your backyard is an easy way to add polish to your landscaping. You may want to complete a brand new paved walkway. However, there are several easy walkways that you can lay in an afternoon to get your backyard summer party ready. The materials used can range from stamped concrete to loose gravel and pebbles. It all depends on the design aesthetic that you are looking for in your backyard. Flower choices are also a large part of your landscaping efforts. If you’ve created a color story on your deck or patio with your décor, you can continue it with the right flowers. They also provide great coverage to hide some eyesores in your backyard. This could range from an old fence that needs updating to your vertical deck supports. 7. Storage helps with the next party. While this is a pre and post party tip, it’s essential to having a successful summer party. Great outdoor storage makes set up and clean up a breeze. By taking the stress out of these steps, you’re able to enjoy the party. There are plenty of outdoor storage options that are convenient, but don’t interrupt the design of your backyard. One of the most popular ways to incorporate storage into your deck is to use multifunctional built in pieces. Benches are a popular addition to any deck design. Not only does it provide additional seating, but you can also design the seat to lift up and open up the space in the bench itself. Sheds are another popular way to incorporate storage into your backyard. If you don’t have the space for a stand-alone structure, find open space in the current deck design. An under deck patio is the perfect place to build a storage shed. It already has a frame in place and is ready to be finished for your storage space. 8. Safety should always be a top concern. No matter what, you’ll want to make sure that you and your guests are safe during your summer party. There are some safety measures that can be taken from the beginning of your deck design and some features that you can add after the fact. Your deck railing is the most important part of any deck design. 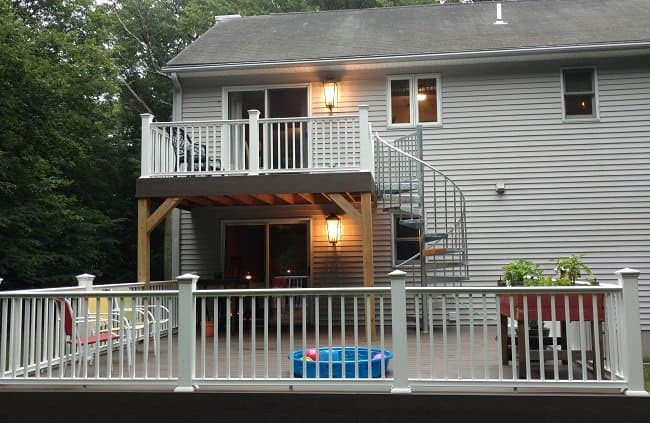 When you have a raised deck design, you must have a railing around the platform to meet building code. Deck stairs are always brought up when deck safety is a topic. With the addition of the elements, deck stairs can quickly become slippery and breakdown faster than a standard indoor stair. Material choice can ensure that your deck stair is structurally sound and will hold up to the heavy traffic of summer party season. Between the Powder Coated Aluminum spiral stair and the Exterior Galvanized spiral stair, there is a design that will fit your deck design. Both designs have a weather proof finish that means your first cost is your only cost. While metal holds up to the elements, it can also become very slippery when wet. Whether it’s in a backyard with a pool or in a climate that’s prone to summer storms, you want to make sure that your deck stairs can be used safely. Designing your stairs with textured steps is a great solution. Whether it’s the diamond plate or a grated design, it’s much safer than a smooth metal surface. If you want to texturize your steps after the fact, there are lots of products available, such as tapes and edges that can be added to your stairs. A safety gate is another great design feature that ensures you and your guests are safe. This is particularly important if you have small children around. Just like the railings, there are several designs, many of which match your deck stair design. 9. Everyone should have a comfortable place to sit. Having plenty of seating is an important part of any party. By providing ample seating options in different areas, you’re catering to each guest’s interests. Finding plenty of seating can be a challenge, particularly in small backyards. However, with the right organization and strategic placement, it’s possible. Built-in benches are a great way to add seating without taking too much space away from your deck or patio. Benches are a great seating option for casual outdoor dinner parties. While you don’t want to overcrowd the table, benches are more flexible when it comes to capacity than individual chairs. Not only do you want lots of seating, but you also want it to be comfortable. There are a ton of outdoor cushion designs out there that range in size and shape to fit whatever furniture frame you might have. If you can’t find one that matches your ideal design, it’s easy to create your own! A lot of craft stores have outdoor fabric that you can use. If you can’t find a fabric that fits into your color story, outdoor textiles are perfect for painting your own patterns. The right paint and sealer can give you a one of a kind design. 10. Have a centerpiece to your summer party. Every entertaining space should have a central focus. It may be a pool or a dining table, but there should be one piece that people can gather around. This creates the sense of community within your get together and organization. A popular option for the center of your communal area is a fire pit. It’s perfect for get together with guests of all ages and can be used well into the fall, rather than just the summer. It also helps to create an outdoor living room. The fire pit takes the place of a traditional fire place and provides a cozy place to gather with friends and family. When you have a large age range with your guests, it may be a good idea to give everyone their own small space in the backyard. Summer parties are often filled with families that include children, teens, and adults. While small children may not mind sharing a space with their parents, teenagers might appreciate their own area. This doesn’t mean being completely separate. With the right organization and zoning, you can easily create separate spaces for each group. Another way to separate the space based on interests would be to have a small game area away from the deck seating. Under deck patios can hold an outdoor game room with a ping pong table and comfortable seating. 12. Backyard entertainment is essential. To continue from the previous tip, there are a few unique backyard ideas to make your summer parties fun and enjoyable for all of your guests. A fun outdoor twist on classic board games is to make your own oversized versions. Giant Jenga is a popular supersized board game that you can make with some lumber and paint. Yard checkers is another popular game. You can make an easy DIY game board with paint and wood or you can lay stone tiles that have different tones. In a checkerboard pattern. The game pieces are fairly easy to make yourself with wood and paint. A more involved form of backyard entertainment is an outdoor movie theatre with an inflatable screen. This should be kept to larger backyards that can fit the extra seating at a safe distance from the screen. Themed parties sometimes get labeled as cheesy and too cliché, but summer is the perfect time for them! Themes essentially do the decorating for you and don’t have to be cheesy if you keep the accents from being too overwhelming. Between Memorial Day, Fourth of July, and Labor Day, there’s no shortage of reasons to deck out your backyard in red, white, and blue décor. Luaus are another popular summer party theme. The bright colors and big flowers that are traditional with a luau are perfect for summer outdoor entertaining. Summer is a great season for outdoor entertaining and getting friends and family together. Any home party can be stressful, but it doesn't have to be! These 13 tips can help you to throw a success summer party without added stress. If you want to find more information on the extra safety features, a quick call to one of our consultative designers can answer any of your questions!